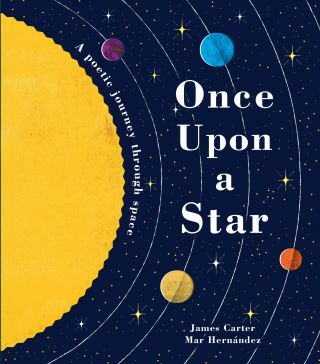 "Once Upon a Star: A Poetic Journey Through Space" by James Carter, illustrated by Mar Hernández. "I wrote 'Once Upon a Star' very much as a starry-eyed poet, not an expert!" the U.K. author and songwriter said of his latest book, "Once Upon a Star: A Poetic Journey Through Space" (Doubleday Books for Young Readers, 2018), a lively, rhapsodic exploration of the cosmos from the "mighty boom, a huge kerang" of the Big Bang to the coalescence of elements that created our "skies so wide and oceans blue." Since he had already written books about his other favorite topics — wolves and electric guitars — the "big expanse up there" was the obvious frontier to conquer next, he said. But Carter wanted to direct his next effort at a younger audience than he did with the aforementioned volumes, making use of simple rhyming verse instead of "heavy scientific detail" to captivate and entertain. As the author of more than 20 poetry books for children, writing what amounted to an extended poem came naturally, he said. "Rhyming verse is great for telling stories that don't want to be bogged down with figures, numbers and facts all the time," he said. "Poetry gives me a freedom that prose doesn't. Plus, I'm attracted to poetry's playfulness, brevity, imagery, its 'less is more,' its musicality with its rhythms, rhymes and repetitions." Not that he did away with the "sciency stuff" entirely, of course. Carter ends the book with an acrostic poem that supplies a light sprinkling of those "figures, numbers and facts." Cleverly, the first letters of each sentence spell out "The Sun," the tome's titular star. Each page is a stunning visual feast, too. Mar Hernández's lavish, almost psychedelically rendered art is so perfectly in tune with Carter's prose that it's remarkable the two never met or talked. "Mar's artwork is absolutely brilliant," Carter said. " And I so love the retro-futuristic space-age look." He said he especially delights in Hernández's depiction of the planet's organisms evolving from sea to land to sky. "It's breathtakingly gorgeous and like Charles Darwin for beginners," Carter said. Carter said he hopes "Once Upon a Star" will serve as a jumping-off point for kids to become curious about the world around them, perhaps beginning with that mass of incandescent gas high above their heads. "I wanted young readers to know that our sun is actually a star, one of many," he said. "It not only created us — and all the various life-forms on Earth — but, crucially, it continues to sustain us with its heat and light." Not to mention we're also made up of that same stardust, a point Carter used to conclude the book. "One of my favourite 'Doctor Who' episodes was a Christmas Day special featuring Australian singer Kylie Minogue," Carter said. "At one point, she disintegrates and someone says, 'Look … she's just stardust.' And I remember putting my youngest daughter to bed that Christmas night and thinking about that, and it's been on my mind ever since. I love the fact that we were made by a star." Carter isn't done probing the universe, either. Other books coming down the pike include "Once Upon a Moon," a story about how Earth's moon may have materialized, and "The Big Beyond," which will dive into space travel.